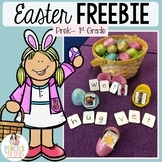 Here is a fun Easter CVC activity for word work or small group! Place the pictures and letters in a plastic Easter egg. Number the plastic eggs. Students will open the eggs, unscramble the words, and write the correct word on the answer sheet. This packet includes games and worksheets. Games1. Cut apart the Easter eggs. Students read the word and match the picture to create an egg.2. DO NOT CUT THE EASTER EGGS. Put them in a pocket chart and hide an Easter Bunny behind one of the eggs. Call on students to choose an egg and read the word. 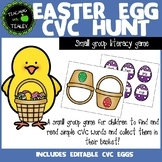 For this station activity you will need the plastic Easter eggs that you can fill with CVC letter tiles. Your students will decode the word, record it, and illustrate it on the recording sheet. 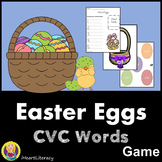 This game allows students to make their own CVC words with a cute twist on Easter. After drawing the letters to make the words, students will determine if the word is real or silly. I hope you enjoy! 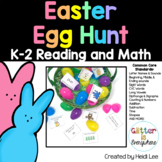 Two page Easter egg worksheet. Sound out and blend words on the eggs, write the word on the line and then connect the word to the matching pictures.Black and white sheet, answer sheet included. 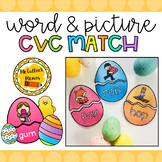 Students use the Easter themed picture cards to match them with the corresponding CVC words. 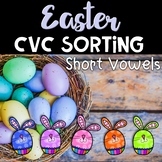 Fun CVC puzzle freebie just in time for Easter. Stamp the corresponding CVC word .